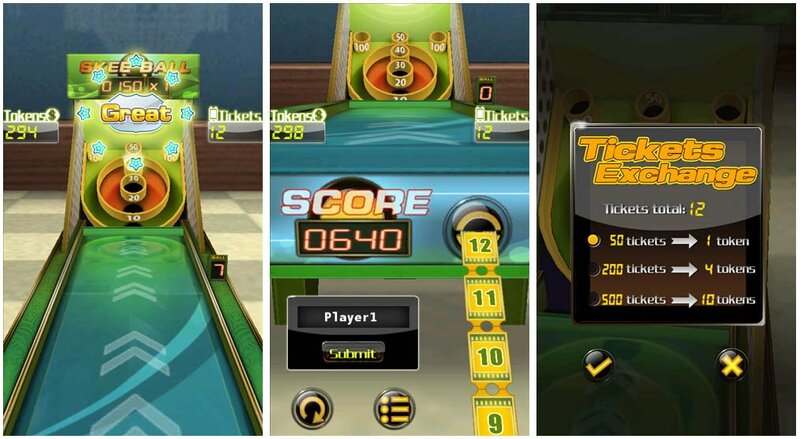 AE Skee Ball brings all the fun of the popular arcade game to your Windows Phone. You play for tickets which can be exchanged for tokens that are needed to play the game. Game play is not unlike the real world game in that you have nine balls that you roll up the ramp to jump them into various points rings. There are some opportunities for bonus points and the more points you score, the more tickets you earn. AE Skee Ball is a fun time waster of a game but there are a few aspects of the game that may not appeal to everyone. From AE Skee Ball's main menu you can launch the game, buy tokens or exchange your tickets for tokens. From the launch screen you can also buy tokens, exchange tickets, access settings, view the leaderboard and start the game. When you start a game of skee ball, it's going to cost you two tokens. You'll have nine balls to use to score as many points as possible. Just slide your finger up the ramp to roll a ball. The direction and speed is determined by how you slide your finger. If you score more than 10 points on a roll, one of the targets will be highlighted. Hit those targets and you earn bonus points. Animations are nice and AE Skee Ball is a fun game to pass short bits of time with. The problem is that it costs you tokens to play a game of Skee Ball. It's nice that AE Skee Ball starts you out with a few hundred tokens but once that supply is exhausted you'll need to buy more or hope you have enough tickets to keep the game going. Tokens range from 300 for $.90 up to 26,000 for $69.90 and can be purchased via PayPal or Credit Card. Ticket exchange ranges from 25 tickets for one token to 250 tickets for ten tokens. The need to purchase tokens to continue playing AE Skee Ball may not appeal to everyone. Especially with no additional prizes beyond the ability to continue the game. It would be nice if you could exchange tickets for wallpapers, additional features or something more tangible like we saw with Skee Ball 7. 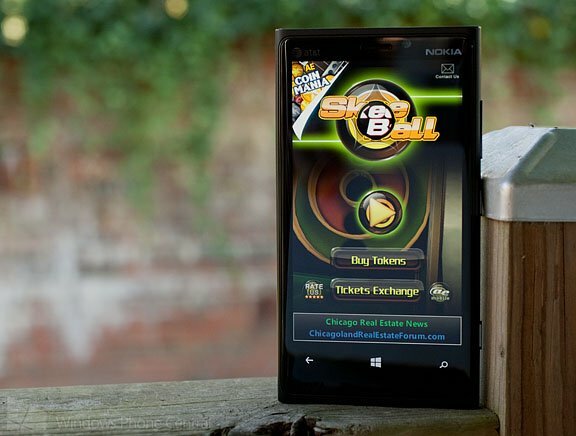 AE Skee Ball is a free, ad supported game for your Windows Phone that you can find here at the Windows Phone Store.